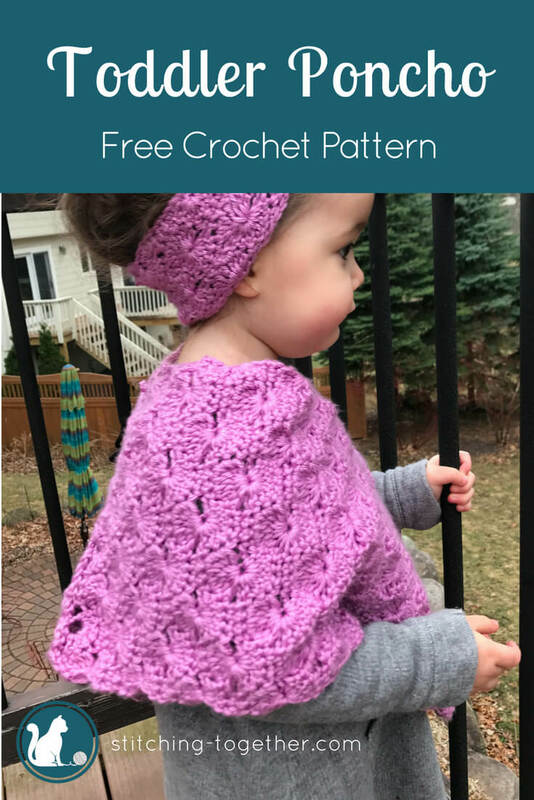 Below is the free pattern for this adorable Starburst Crochet Toddler Poncho! If you have a toddler, had a toddler, been in the same room with a toddler, or even come so close as to see one on a YouTube video, you know that a toddler’s life phrase is “I WANT TO DO IT MYSELF!” or some savage variant thereof. My tiny toddler wants to do everything just like her big brother who has barely escaped toddlerdom himself. Since big brother can get dressed and put his coat on by himself, she wants to as well. Unfortunately, sleeves are a little tricky when you are 2 years old and don’t have full control over all moving parts of your body. 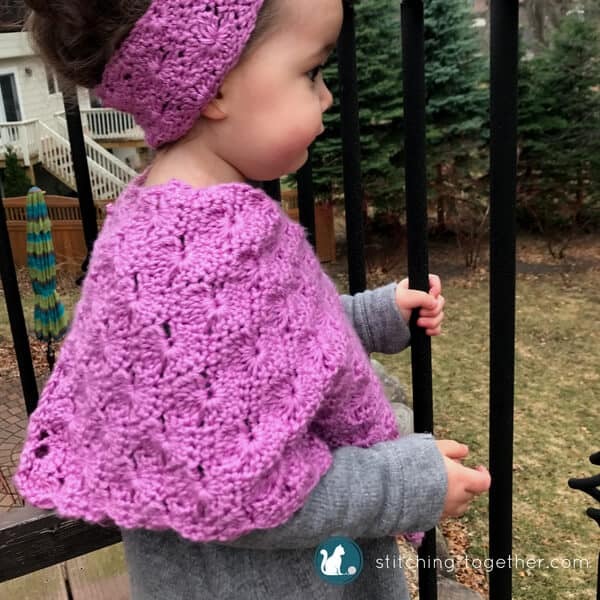 Since it is warming up here in the frozen north, a toddler poncho (the glory of the poncho being that it is sleeveless) seemed in order for spring and for success getting the tiny tot out the door. She can easily slip this over her head and we can mercifully avoid the “I wanna do it myself, I can’t do it, help me now, no I do it myself” meltdowns. Amazing. Now that my little gal pal is no longer a toddler, I’ve been wanting to make her a larger poncho and provide additional sizes. Come to find out, this pattern works great in the toddler size range but not so much in the larger sizes. As you move to the larger sizes, the neck hole becomes too large especially for a kiddo who is on the petite size anyway like my daughter. I still made her the larger poncho sized for a 4 year and added some rows of single crochets and double crochets to the neck hole. I will add the starting chain numbers for the 4-year-old size in parenthesis within the pattern. Don’t forget to save the Starburst Crochet Toddler Poncho on Pinterest! yo and draw through all 5 loops. yo and draw through all 8 loops. The poncho is worked making 2 rectangles and joining them together. If you don’t mind the pattern going in different directions, you can make two identical rectangles. I made one rectangle with the pattern going vertical and the other with the pattern horizontal so the poncho would look a little more seamless. Each rectangle will be roughly 10″ wide by 20″ long. 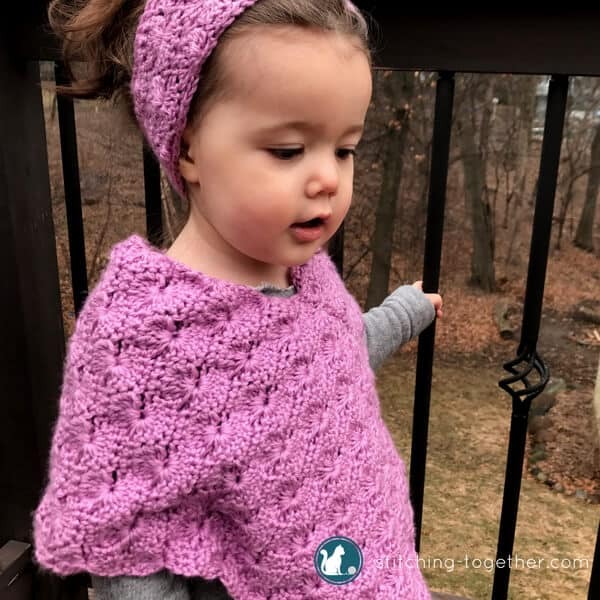 Starting chain values are provided for a 4-6 year old sized poncho, but you will need to add stitches around the neck hole after the poncho is sewn together to make it smaller. The size of the neck hole increases significantly from the toddler size to the larger size. End each rectangle on a row 2 repeat or a row 4 repeat once the rectangle has reached the desired length/width. Row 2: dc4tog (over sc, sc dc, dc), *ch 3, 3 sc, ch 3, dc7tog (over dc, dc, sc, sc, sc, dc, dc), repeat from * ending with 4dctog (over dc, dc, sc, sc). Ch 2, turn. Repeat rows 2-5 until rectangle measures about 10″ wide. Lay the rectangles in a “V” shape on top of each other making sure the pattern is flowing in the same direction. Fold the top of the rectangle on the bottom down so it meets the long end of the top rectangle. Fold the top of the top rectangle back so it meets the long end of the bottom rectangle. 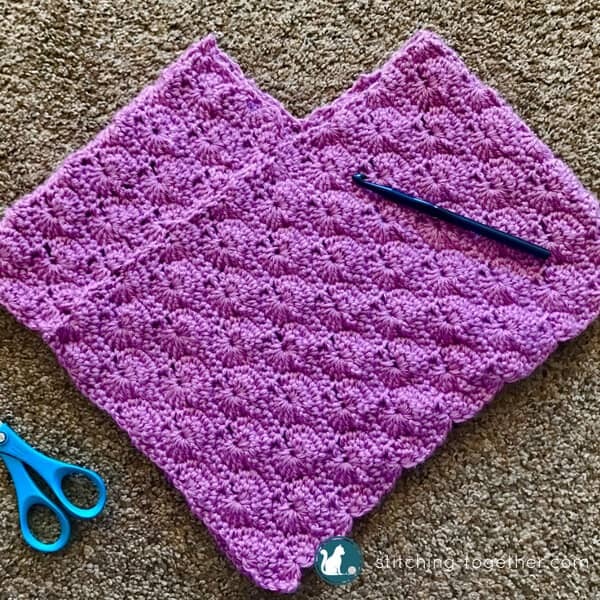 Sew or single crochet the rectangles together. 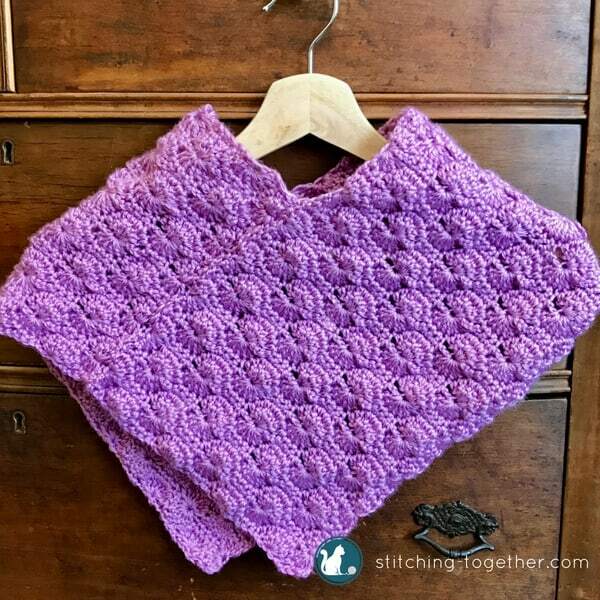 Sewing the rectangles together means you end up with a crochet toddler poncho which is completely reversible (a big win when wanting to give your little one some independence), but it isn’t quite as secure as single crocheting it together. Optional: Add a row of single crochets around the neck hole. Looking for more great Toddler Crochet Patterns? Is this pattern available in 10/12 size? What size is the Stardust Toddler Poncho? I need a size that would fit a 3-4 toddler. I’m not too experienced in making or changing crochet patterns. Could you help me please? Thank you for your wonderful patterns. I’m going to make that darling fringed dress. Would that fit a 3-4 toddler size? Thank you for any help you can give me. Hi Carol! I made the poncho for my then 2 year old who is now 3 and needs a bigger size! I would say, as written it would be better for a 1-2 year old. The starting chain can be adjusted by adding multiples of 10 which, for my crocheting, would add about 2.5 inches. If I make her another one, I would probably add 20 to each starting chain and then about 5″ in length to each rectangle. Does that make sense? The other toddler dress should for sure fit a 3 year old but is REALLY easy to adjust if you need to. I measured around her hips and added an inch. Each side of the chevron was half of that width (hips=22″ so each side was 11.5″) Since you are making a giant “v” instead of a straight line you do need to work a couple of rows before you measure. Let me know if you have other questions! Thank you for this pattern! I feel it’s a bit incomplete, however. What chain do you begin on? And row 2 does not match up. Am I correct to assume it should be “ch 3, SKIP 1 STITCH, 3 sc, SKIP 1 STITCH, ch 3, dc7tog”? Hi Kate! Knowing which chain to start in would be helpful!! Thanks for letting me know. The first sc goes in the second chain from the hook. For row 2, the dc4tog starts in the very first sc. you shouldn’t have to skip any stitches. Please let me know if this helps. (I’ll update row 1 when I can hop on my computer). Thanks again!